Reservations: Reservations are made on a first-come first serve basis and are tentative until deposit and signed contract have been secured. Once signed contract and deposit has been secured your event is then guaranteed. Payment: 50% non-refundable deposit is due at the time the contract has been signed. The final balance is due prior to your event at the time of our set up. We accept cash, money orders, and most major credit cards including: MasterCard, Visa, Discover and American Express. Weather Guarantee: You may shift event dates due to forecasted inclement weather. 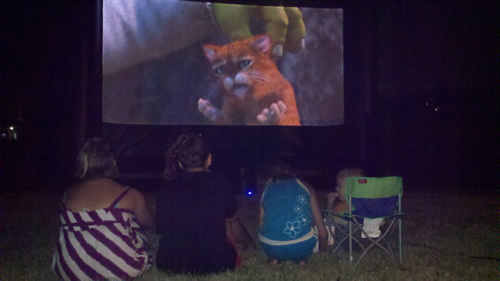 Buckeye Outdoor Cinema will accommodate you with all of our available open dates. No additional charges will be applied if you change your event date due to inclement weather. You must call to reschedule at least 3 hours prior to your scheduled event and/or before our staff has begun to travel to your event. 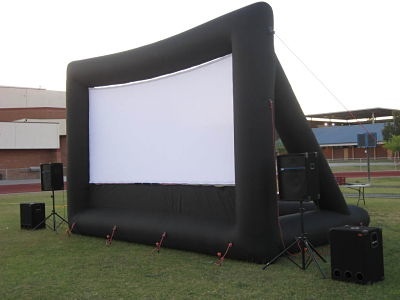 Weather Policy: If during setup or during the event the weather looks threatening (imminent rain, rain, looming thunder clouds, dangerous winds capable of damaging equipment) Buckeye Outdoor Cinema reserves the right to protect its own equipment by canceling setup/production. 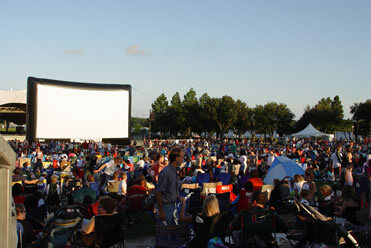 Buckeye Outdoor Cinema reserves the right to delay setup or to pause the production until suitable weather conditions exist. Earliest Movie Starting Time: Our projectors are bright enough to see images on the movie screen 15 minutes before sundown. For the best possible movie experience we always suggest starting the movie 5 minutes after sundown. Sunset times are available from SunriseSunset.com. Do I need a license? : The answer is that it depends. 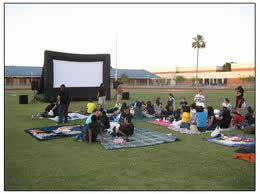 If you are hosting a backyard movie screen party in the privacy of your own home you will NOT need a film license. 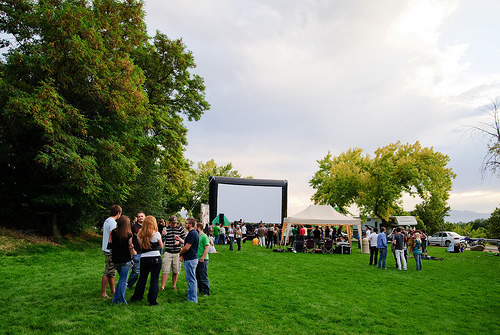 However if you plan on staging an inflatable outdoor movie night in a public place you need to purchase the appropriate non-theatrical license. We will help you with the entire process. Public Place theatrical license: You may obtain a license by visiting Swank Motion Pictures Inc. at Swank.com. 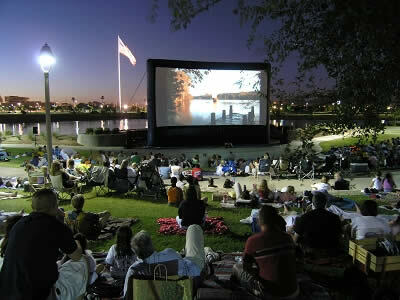 Buckeye Outdoor Cinema has insurance: We maintain general liability insurance. So relax, and enjoy the movie. Setup/Tear Down Procedures for a Public Event: We begin setup approximately 1 hour before sunset.The Inflatable Screen will be setup within 3O minutes. Audio equipment tests begin immediately after the screen is standing, and projection tests begin at dusk. 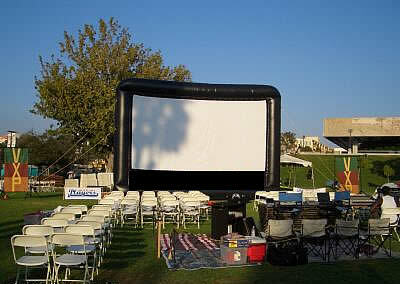 The Inflatable Screen will begin deflating 10 minutes after the end of the movie, unless otherwise specified by customer. After the movie, all equipment will be removed within 1.5 hours. Please note procedures may vary based on rental agreement made with customer. Electrical Generators: We can supply the power for our equipment, giving you great flexibility in choosing locations for your event. Please make sure you discuss your power needs with one of our Movie Screen Pro's. Indoor use: All of our screen packages can be used indoors. In fact, a large majority of our customer base rents are packages for indoor use. Give us a call to discuss your indoor event. Advance Reservations: Friday and Saturday are always in high demand so we recommend reserving your equipment as soon as possible. 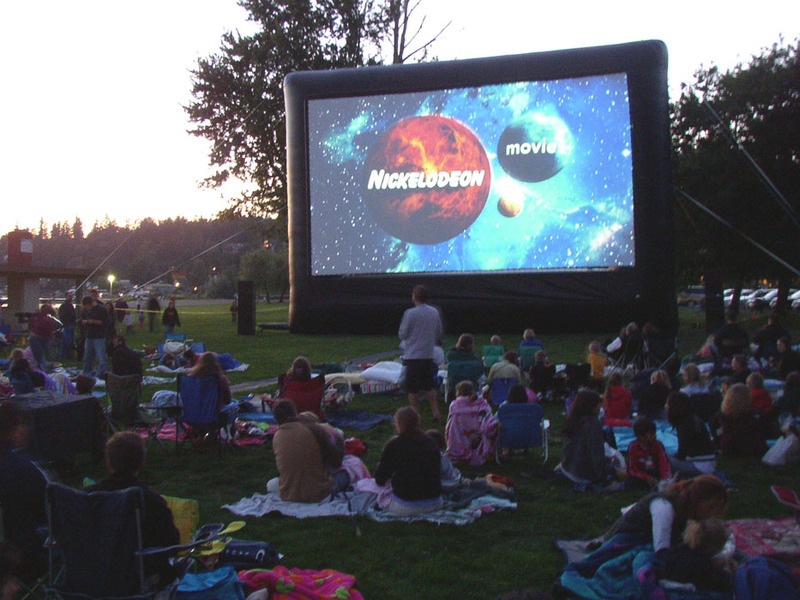 Buckeye Outdoor Cinema does carry a wide range of screens and equipment so we are able to accommodate the “last minute shopper” in most cases. 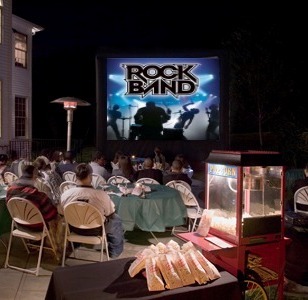 Can I just rent the inflatable screen? : Yes! You can also rent our projector or audio equipment separately as well. Give us a call to discuss your needs. I am not a technical person, will I be able to handle a backyard movie night without having a Buckeye Cinema technician on site? : Yes, all of our equipment was carefully designed to be a "Plug and Play" system allowing anyone to run a Backyard Movie night with ease. During set up our Movie Screen Pro's will set up the equipment and show you the ropes and ensure your completely comfortable with our equipment. Public Place theatrical license: As the equipment provider, we are legally not permitted to obtain the license for you, the end-user. You may obtain a license by visiting Swank Motion Pictures Inc. at Swank.com.